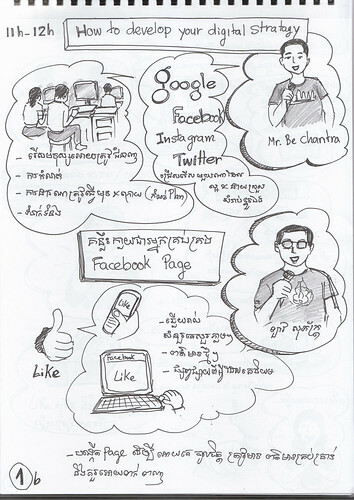 September 13 and 14th the Our Books team attended Barcamp Phnom Penh, with ‘sketchnote’ artists Vuth, Kong Monirath, Prum Vannnak and Sao Sreymao! 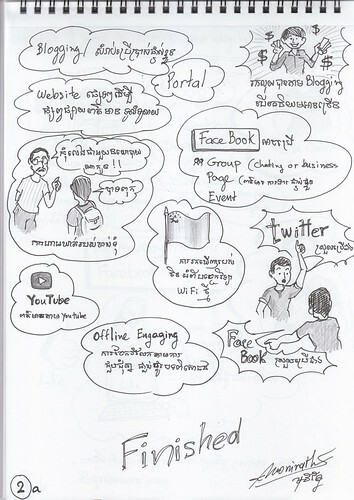 We are welcoming feedback on our ‘Open Source’ comic now in English, German, Khmer, Lao, Thai & Vietnamese. A small selection of these will be on display at ‘Rik Reay’ gallery in Phnom Penh, from March 31 to April 19th. It’s not a strict habit in Cambodia to make ‘resolutions’ for the coming year. But it is definitely a time for reflection and review. At Rik Reay Gallery, we asked contemporary Khmer comic artists to present NEW thoughts, resoutions, reflections, and aspirations. 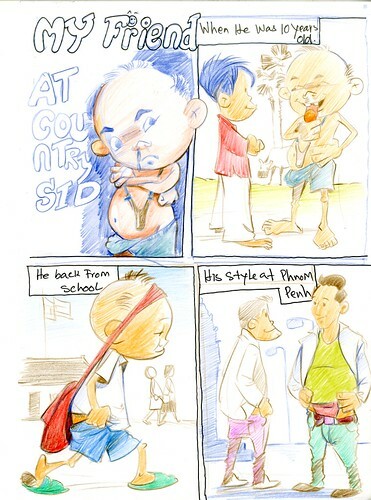 Art includes works by Tek Tevin, Sin Yang Pirom, Sao Sreymao, Moeu Diyadaravuth, Chan Pisey, Kong Monirath, Peou Ty, Prum Vannak, and Pal Poursith, with colors by Kim Phally. You can also see the entire set as a feature on Khmer Connection. Our Books wishes you and yours the very best for a Happy New Year! Happy New Year 2014 From Our Books! In Cambodia, we like New Years’ Day so much that we celebrate it three times. Best wishes from the Our Books team to you and yours. ‘Stay tuned’ for a special New Year Exhibition! 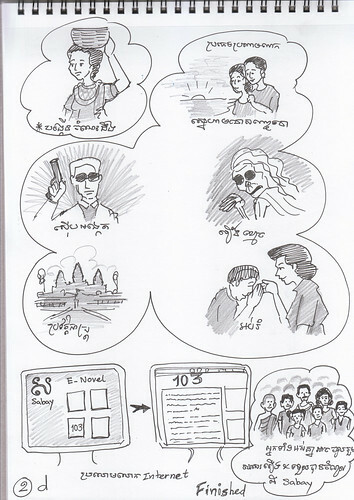 Our Books works to cultivate Cambodian comic art and share it with the world. 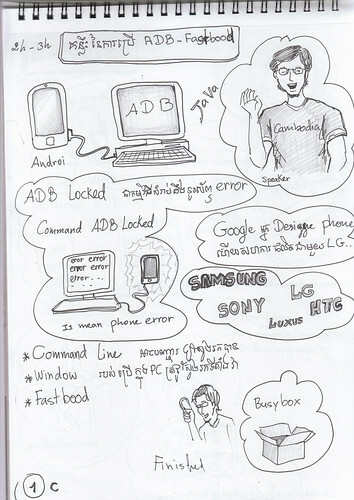 (December 18 -28)Illustrations are by Moeu Diyadaravuth, Tek Tevin, and Chan Pisey, with colors by Sao Channa and Kim Phally. We wish you and yours the best this holiday season. Ilustrator and cartoonist Prum Vannak is largely self-taught, and takes his inspiration from the world around him. He has received acclaim in using his art to depict the harsh reality of his time spent trapped on a Thai fishing boat, and is a survivor of labor trafficking. This led to an award from the US Department of State, and his art being featured in a documentary film and on the Radio Free Asia web site. Unlike most Cambodian illustrators who chase freelance work in Phnom Penh, Vannak lives with his family in rural Pursat and is working hard to make a living from commercial art. While he is famous internationally, his income and his daily life in the village have not changed much. This exhibition explores the two worlds the artist lives in. The exhibition will take place Wednesday November 20th to Saturday December 14th at Rik Reay Gallery, Phnom Penh. Venue: Rik Reay shop, 69c, Street 178, Phnom Penh, Cambodia. It’s time to draw! 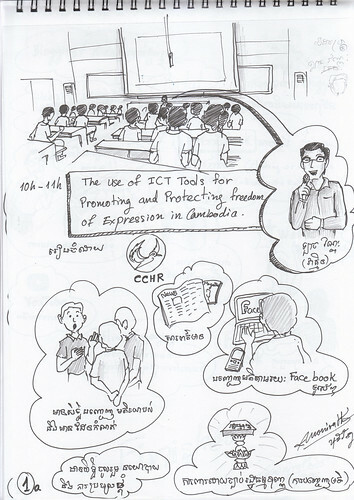 This year at BarCamp Phnom Penh, the Our Books team will host a drawing session and compile the results as an online comic! Join the Our Books team and local artists as we do collaborative ‘jam strips’ and short sketch exercises. New artists and amateurs are encouraged, all are welcome. 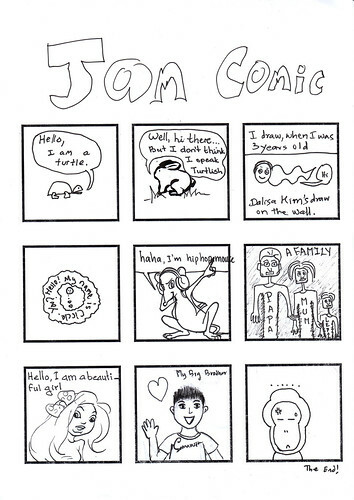 Barcamp Comic Jam 2013 Read on Scribd (below) or download from DropBox.